I have used Delphi a lot but until now not realized how powerful events are. During the last week I got an Aha experience when I realize what can be done. And how clean code can be written with events. An event is the same a a function pointer for those that use for example C or C++. Delphi have a lot of predefined events. For example a button can have OnClick, OnExit etc. It's easy to use them as Delphi IDE helps you with that. If you use custom events it can help you break dependencies between classes. This make it easier to write tests for the code and refactor it. 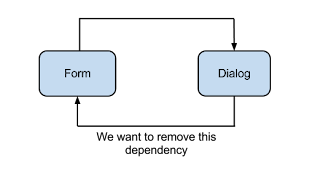 This illustrate a form that create and show a dialog. This dialog may also be called from 2 other forms. In the dialog there are special cases to handle this. So what happened was that we have broken the dependency from FrmFindParcel.pas to the owners TBookForm, TPlanForm and TOrgForm. This means that it is now easier to test frmFindParcel as a separate unit. Method MakeOrderClick is now simplified and is not aware of the owner. If else is also gone. But we don't need to stop here. With a small addition we can make own custom events as the blog title suggests. We added 2 new events OnSetOrder that is a procedure with 2 parameters. And OnGetOrder that just return an order. So to break dependencies and make code more testable, own custom events are a powerful tool to accomplish that.